Well as my readers know by now, Hazel is going through the princess stage. She loves the princesses and has loved them even before she knew the stories about them. Although we try to not expose her to media, when she has been sick this past few months we have caved and let her watch Cinderella and Pocahontas (on video--yes we still own a VCR which is good since I inherited a dear friend's Disney video collection). Well I got to thinking that I would like Hazel to know the real story of Pocahontas rather than Disney's version. Plus it gave me something to research. Have I told you how much I love Native American stories and culture. (I took enough courses on them in college to minor in it.) I have always been fascinated by their cultures and harmony with their environments. The first thing I discovered was that the facts are a bit unclear about Pocahontas. I find different versions of the story almost every place I read it. Apparently are stories mostly come from what the English settlers recorded and not from Native Americans, so you also have to take that into consideration as you read the stories. My goal however was to get some more truth and background for Hazel about one of her princesses (and yes she has named a baby doll Pocahontas, so she likes her). 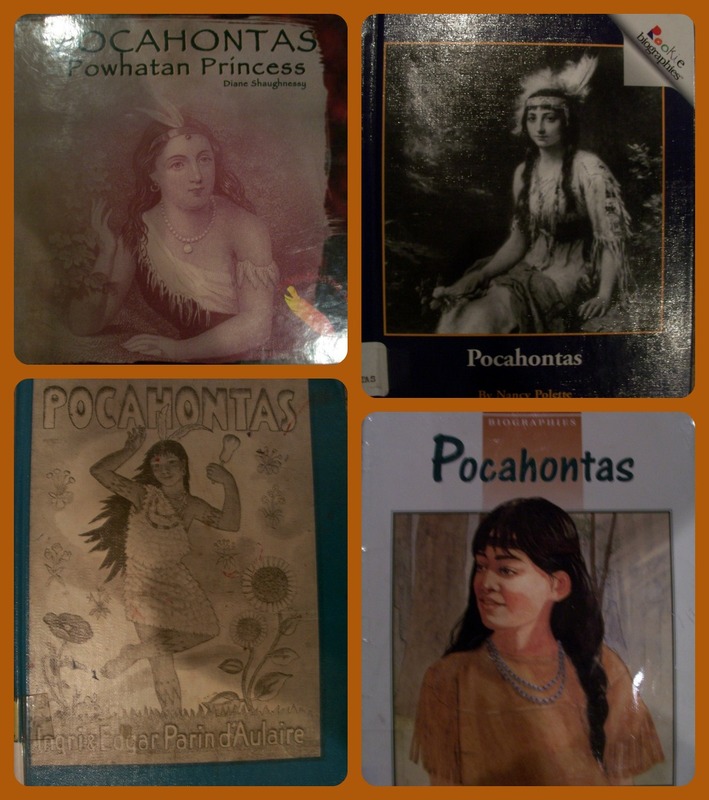 I found some books at the library--well through the library network on Pocahontas that were age appropriate for Hazel. Hazel has been enjoying the stories though she often is asking me who people are in the pictures. The first is Pocahontas: Powhatan Princess by Diane Shaughnessy. This is an easy read book that gives the details about where Pocahontas lived and the brief details of her life. The second is Pocahontas by Nancy Polette. This is another easy reader with illustrations and large print. It reads more of a story than just facts. It gives the basics of her famous life. The third is Pocahontas by Ingri and Edgar Parin d'Aulaire.This is the longest (and definitely oldest of the ones I took out). It goes into many details the others do not. It has illustrations throughout it and goes through in much detail her life. The fourth is Pocahontas by Jan Gleiter and Kathleen Thompson. This book starts with Lady Rebecca Rolfe (Pocahontas) remembering her life in Virginia with her father and tribe. It goes through her life basically from meeting John Smith onward. It is more of a book for older readers or to be read by an adult. Things I learned are that Pocahontas was not her birth name, but a nickname given to her because of her personality--it means playful one. 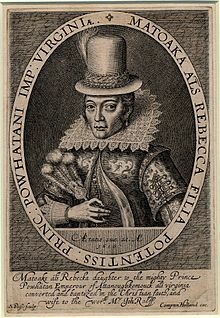 Even with all the help Pocahontas gave the English settlers they still kidnapped her to try to ransom her for things with her father, but their plan backfired when Powhatan (another interesting thing--the chief takes the name of the tribe when he becomes chief) refused to give them everything they wanted in trade. 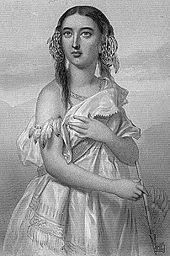 Instead one of the settlers, John Rolfe fell in love with Pocahontas and married her. 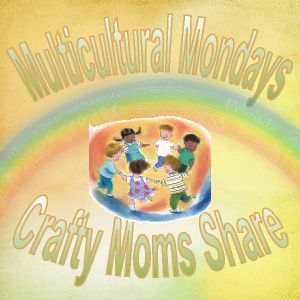 We have not done any Native American crafts as of yet, however Daria has some great music crafts over on her Monthly Song. Oh, and she has some great giveaways there as well!! We did however make a Native American stew last week. We got the recipe from a book I picked up at Foxwoods Casino last summer, More Than Moccasins by Laurie Carlson. When we had the second storm and Steve had to work through dinner we decided to try a recipe for Corn and Pumpkin Stew. This stew was eaten by the Havasupai people who lived at the bottom of the Grand Canyon. 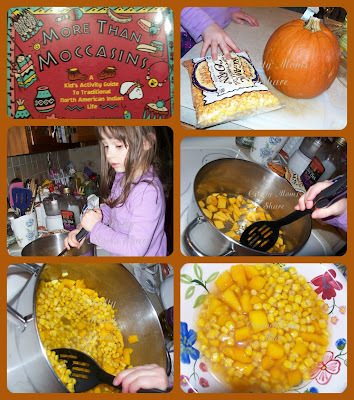 The recipe is very easy: a small pumpkin, 3 ears of corn or 2 cans of whole kernel corn drained, 2 cups water and a teaspoon salt. We however added some more spice and more water. We decided to add some nutmeg and cinnamon (of course since Hazel thinks we add cinnamon to everything). It was all right, however not something I would want all the time or as a complete meal. Hazel got very into stirring the stew and loved cooking it. Today I thank God for all of all veterans and service men and women and their families who sacrifice so much for our protection and freedom! That looks like it was a lot of fun. 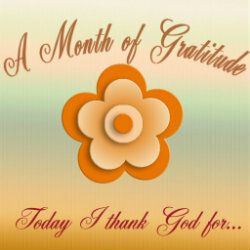 I appreciate you sharing on "I Gotta Try That Monday"